Plastic has long been one of the top environmental issues of our time, but that could change thanks to a new type of biodegradeable plastic invented at Harvard’s Wyss Institute. The bioplastic is made from something called chitosan (I believe pronounced “kite-o-san”) which is the second-most abundant organic material on the planet. It’s the same stuff that’s in the shells of crustaceans, bugs, and even butterfly wings. Harvard engineers have figured out how to take chitosan from shrimp shells and mix in a certain protein from silk. 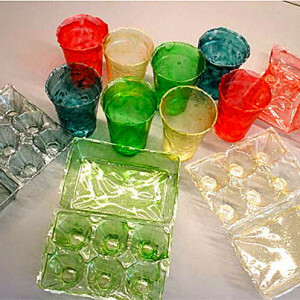 The result is a clear, strong, cheap to make, renewable “plastic.” Cool, right? Here’s the full release if you’d like to read more. Love Amazon and spend a lot of time on Twitter? You’re in luck! Amazon and Twitter have paired up to let you add things to your Amazon shopping cart when you’re on the social media network. Once you link your Twitter account with your Amazon account, if you see a tweet with an Amazon link, you can reply with the hashtag #AmazonCart and bam! It’s in your cart. Why? Because shopping on Amazon was just way to hard before 😉 Seriously though, a lot of the press is speculating this is the first of many shopping/social media mash-ups meant to part you with your money. One problem? Anyone watching that Twitter thread will know what you’ve added to your cart. Well, *some* parts of your body have to touch the toilet, but not your hands. In recent years we’ve seen the introduction of touchless soap dispensers, faucets, and more–it only makes sense we can now have a touchless toilet! It’s a Kohler innovation and works via “an electromagnetic field through the top of the tank lid that senses your hand, causing the toilet to flush” which apparenty more accurate and reliable than touchless beam technology. For $99 you can retrofit your current commode (well, most can be converted). While I wouldn’t add this to my Mother’s Day wish list, it is, admittedly, kind of an interesting product. Alibaba files for an IPO…why should you care? The news of Alibaba’s IPO filing hit the tech and popular press with much fanfare this week. So what? Alibaba is HUGE in China. In fact, based on its valuation, it’s in the top 10 of the world’s biggest tech companies and had $248 billion dollars in transactions last year (which is more than eBay and Amazon combined!). Alibaba is a company made up of different websites and enterprises. Alibaba.com is a space for business-to-business sales, but there is also TaoBao which is described as an “eBay-like consumer-to-consumer sales site,” and TMall which more like Amazon.com where businesses sell to customers. Tossed in the mix is Alibaba’s cloud computing and messaging offerings as well. Having an IPO here means that Alibaba is gearing up to take the U.S. by storm, so I’m sure you’ll be hearing more about this company (and their websites) in the coming year. Rolling Stone spent a few days with Notch—a.k.a. Markus Persson, the creator of Minecraft—and his company Mojang. The piece paints a portrait of a guy who is a little child-like, possibly a bit manic, and certainly living in the moment and enjoying the ride that comes with having one of the most popular games. It’s not super long (2 pages), but I recommend it. I have to say, if I had the skills, I’d want to work for Mojang for the all-company trips! The good news is current Netflix subscribers won’t see a price increase for two years. The bad news? New members will have to pay a dollar more than those of us already on the subscription movie/streaming service. If you live in Europe or the UK and reading this, you’re also getting bumped up a pound/euro. In the U.S., the new rate is now $8.99 for a basic streaming plan. The silver lining is, along with the price increase, Netflix is rolling out a cheaper, standard-definition-only streaming plan for $7.99 (note: you can only play back one video at a time with this less expensive plan). Beats—you know, the headphone and music company started by Dr. Dre—is apparently about to be purchased by Apple for $3.2 billion. If it happens, it’ll be Apple’s largest acquisition ever. Why Beats? The press is speculating Beats will help get them a toe-hold in the music streaming business which hasn’t been big for them (iTunes Radio hasn’t hit big since it’s introduction last year). Beats’ headphones are also much better than Apple’s, apparently (I wouldn’t know from experience). We’ll see if there is an official announcement in the coming days – watch for it. Keep hearing about 3-D printing but just don’t get it? Mashable has a really great video explaining how 3-D printing works. I’ve been following 3-D printing a bit, but I had no idea they had 3-D printed houses! If you’re a fan of SuperMario…or mariachi bands…you’ve gotta check this out. Hilarious!